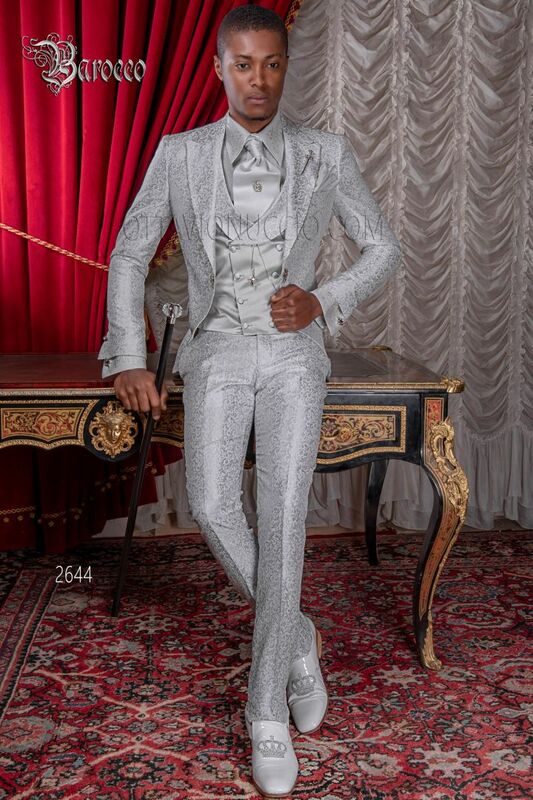 Pearl grey brocade slim fit suit with diamante lapel and crystal frog closure. Peak lapel, one vent at back and Redingot... Pearl grey brocade slim fit suit with diamante lapel and crystal frog closure. Peak lapel, one vent at back and Redingote-style seams. Light grey lurex shirt with covered button arrangement. Silver dragon embroidery on collar and cuffs. Cuffs with pattern... Light grey lurex shirt with covered button arrangement. Silver dragon embroidery on collar and cuffs. Cuffs with patterned button. Socks made from light grey lisle cotton. Slippers made from white patent leather with silver-tone crown embroidery. Baroque-style nickel-tone cufflinks with drop design and clear rhinestone at centre. Nickel-tone brooch with sword design. Chain with silver tone sword pendant and crystal diamante.